How would you like to win a Google Pixel 2 XL phone worth over £400? Yes? Read on… No? Go and make a cuppa. To celebrate the release of the brand new Google Pixel 3 phone, we at Mazuma want to give a Pixel 2 XL away, to you, for free! Yes, that’s right, we’re just feeling generous. So, how do you win? Well, ever since Google released their first Pixel phone, they have always had great cameras, and the Pixel 3 is no different. Inspired by the Pixel 3’s dual front facing cameras for wide group selfies, and a top shot feature that automatically picks out the best photo, we want to see your BEST selfies! Be fun, be creative, be different, stand out from the crowd, make us smile, make us laugh… make us go “aaahhh” and “ooohhh”! To enter, simply visit our Facebook or Instagram page, like the post and add your amazing selfie in the comments section using the hashtag #MakeItMazuma. The post will go live from 7pm on Thursday 11th October and the competition will close 10am on Wednesday 31st October. We at Mazuma HQ will then have a great time drinking coffee, eating biscuits and picking our favourite selfies! The best one will win the Pixel 2 XL phone, 2 runnerers upperers will get a Maz toy and a £10 retail voucher. Please remember to take care of your self(ie)! Stay safe, keep it clean and most importantly, have fun! You must have taken/own your image and have permission from any other people in the photo before posting. 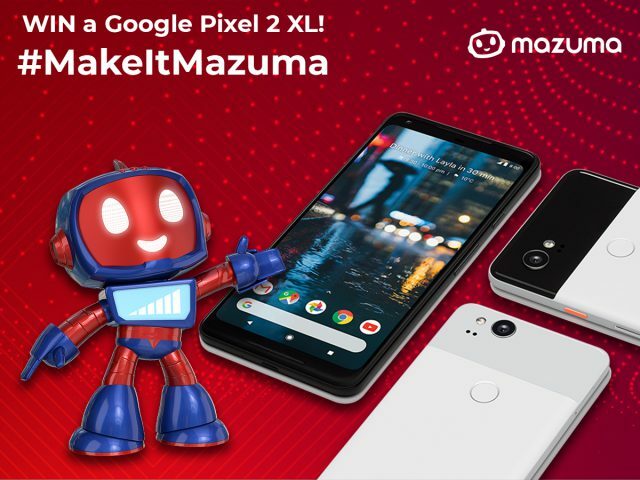 Fans of the Mazuma Mobile Facebook page can enter a prize draw in which 3 winners will be selected from all valid entries and will receive 1st prize: a refurbished Google Pixel 2 XL phone in “excellent” condition. 2nd and 3rd prize: [insert prize details here]. To enter, fans need to like the post and then submit their most fun and creative selfie in the comments on the promotional post at www.facebook.com/mazumamobile. Entries can be submitted from the time the post goes live on 11/10/18. 3 winners will be selected from all valid entries and will each receive a one of the prizes listed above, subject to availability. Employees of Mazuma or EcoRenew UK cannot participate in the competition. The Promoter reserves the right to verify entrants’ eligibility. The competition opens at on 11/10/2018 and closes at 10:00 on 31/10/2018. The winners will be chosen based on best entry from all valid entries submitted prior to and including 11/10/18 to 10:00 on 31/10/18. The winners will be notified by a comment on their post within two days of the closing date and asked to contact the Promoter via an inbox message on Facebook. Proof of age may be required. Winners’ names and counties will be available by sending a stamped SAE to the Promoter at the address below, within 3 months of the closing date, marked #MakeItMazuma Creative Selfie COMPETITION, Mazuma Mobile, The Old Reebok, White Lund, Morecambe, LA3 3PB. In the event of any dispute regarding the prize draw, the decision of the Promoter is final and no correspondence or discussion shall be entered into. The Promoter reserves the right to disqualify any entrant if it has reasonable grounds to believe the entrant has breached any of these terms and conditions. Any personal data relating to entrants will be used solely in accordance with current GDPR legislation and will not be disclosed to a third party other than is absolutely necessary so as to fulfil the prize offered under this prize draw without the individual’s prior consent. The Promoter is Mazuma Mobile, The Old Reebok, White Lund, Morecambe, LA3 3PB. All communication regarding this promotion should be forwarded in writing to Eco ReNew UK’s Head of Marketing at Mazuma Mobile, The Old Reebok, White Lund, Morecambe, LA3 3PB.